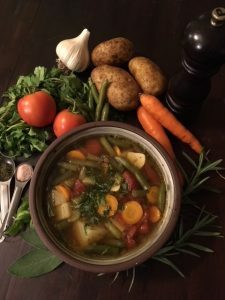 Change of seasons, time to make soup! Try this healthy, easy to make recipe that can be prepared in under 45 minutes. In a large sauce pan, saute onions, carrots, and celery until onions are translucent. Add chicken stock, potatoes, tomatoes, and garlic. Bring to a boil. Add salt, pepper, basil, and thyme. Reduce heat and simmer for about 20 minutes or until potatoes are cooked through. Add green beans and simmer for about 10 more minutes. Serve hot. Garnish with parsley or dill. There are many ways to prepare Miso Soup. Here is a basic recipe using NFCA frozen veggies. Boil edamame shells in a saucepan with a teaspoon of salt and enough water to cover for 8 minutes. Drain and shell, keeping the edamame beans. In a saucepan, add miso, mushrooms, ½ of the scallions, ginger, and water and bring to a boil. Simmer for 8 minutes. Add corn, broccoli, and edamame to miso broth. Bring back to a boil, simmer for approx. 2 more minutes. Serve with garnish of remain scallions.